This type of massage treatment can encompass techniques from deep tissue, fascia release, Swedish massage and assisted stretching. Some goals include decreasing pain, stiffness and increase injury repair and range of motion. Every step of the way, massage can relieve soreness and pain. As your shape and posture change, we make accommodations with special cushioning systems to help keep your comfortable and safe. Cupping is a ancient form of alternative care in which the therapist put cups on the skin to create a negative suction pressure which helps to decrease fascia restrictions, increase blood flow and reduce pain. When cupping we use plastic and/ or silicone cups. The plastic cups remain still on the skin and have a more intense effect. They are more likely to leave circular marks on the skin for an average of 3 to 7 days. The silicone cups can be left in one area or more commonly, we use them to glide over the skin. We can include this in with your regular massage treatments. When you come in for your massage appointment we can assess to see if this treatment is right for you. Thai massage is an ancient healing therapy. It is performed on a large floor mat while the client wears comfy, stretchy clothes. The therapist moves in tandem with the client to apply passive or dynamic yoga stretching while compression techniques of the palm, thumb, elbow, knee and/or feet are applied in a rocking motion to the client. 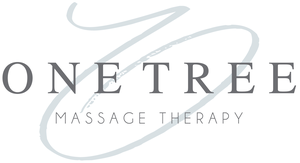 Thai massage at One Tree is performed by a RMT and is billed as Massage Therapy which is covered under many benefit plans. Instrument Assisted Soft Tissue Mobilization (IASTM) is a soft tissue technique that uses a hand held tool on your muscles and fascia with the goal of breaking adhesion's and optimizing your muscles function. Acupuncture can be incorporated into your massage treatment to help improve the bodies function and promote natural self healing by stimulating acupuncture points. Sterile single-use needles are used.